Allium Sativum.Applied externally garlic acts as a stimulant, rubefacient, and blister. Internally, it is often useful in diseases of languid circulation, and interrupted secretion. In cold leuco-phlegmatic habits it is a powerful expectorant, diuretic, and if the patient be kept warm, sudorific. It is thought to be an emenagogue. But in cases where irritability prevails, large doses may be injurious. As a condiment, taken in moderation, it promotes digestion; taken in excess, it produces headache, flatulence, thirst, etcetera. In fevers of the typhoid kind its virtues have had a good effect. It has succeeded in curing obstinate quartanagues. In catarrhal disorders of the breast, spasmodic and pituitous asthma, flatulent colics, hysterical and other diseases, proceeding from laxity of the solids, it has good effects. Sydenham says that he has known the dropsy cured by the use of Garlic alone. Cotton saturated with the juice, and put into the ear is good for deafness. Renew it several times a day. Applied as a poultice to the pubis, it has promoted the flow of urine. 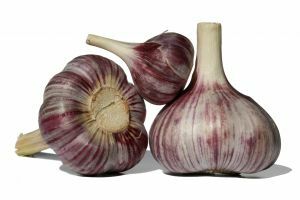 Sydenham regarded Garlic as a powerful means of causing a derivation or revulsion from the head, applied to the soles of the feet. For this he used it in the confluent small�pox, about the seventh or eight day, after the face began to swell. The root cut small, and tied in a linen cloth, was applied to the soles of the feet, and renewed every day till the danger was over. A dose or two of the juice of Garlic may be taken in the morning for worms. An infusion of Garlic, made of half a pound of the bruised roots to a pint of boiling water, two spoonfuls before and after every meal, for epilepsy. Of the syrup of Garlic, made of one ounce of the expressed juice, to 12 ounce of lump sugar, a tea-spoonful taken occasionly by children, for coughs, without inflammation. Of the milk of Garlic, 2 drachms , of the bruised bulbs boiled in 6 or 8 ounces of milk, useful as a clyster for thread-worms in children. Wine of Garlic, three or four bulbs bruised and macerated in a quart of proof spirits, is a good stimulant lotion for baldness of the head. If you are troubled with asthma, take a number of bulbs, and boil till they are soft; then dry them well. Put an equal quantity of good vinegar to the water in which the bulbs of Garlic have been boiled, add sugar, and boil into a syrup. Pour the syrup over the dried bulbs, and secure in a jar for use. Take a bulb or two in a morning fasting, with a little of the syrup, and you will find relief. We are informed that Dr. Bowles secured a large fortune by this remedy.